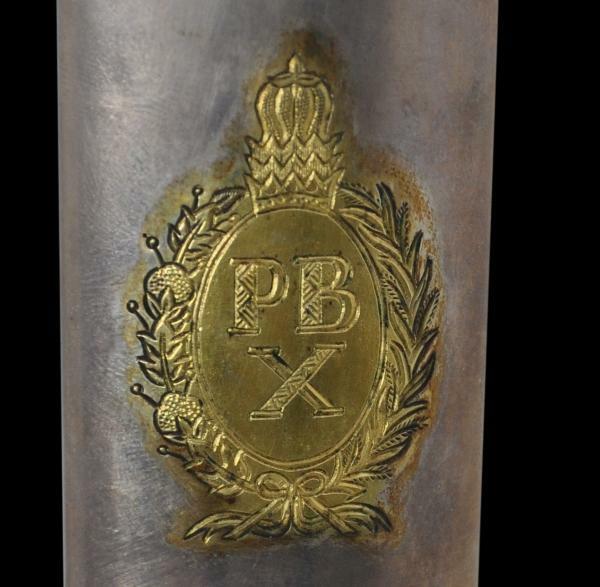 This kris, the back of the scabbard engraved and gilded with the cypher of Pakubuwono X, Suhanan of Surakarta (Solo), was most probably a presentation kris given by the palace (kraton) to a visiting dignitary. 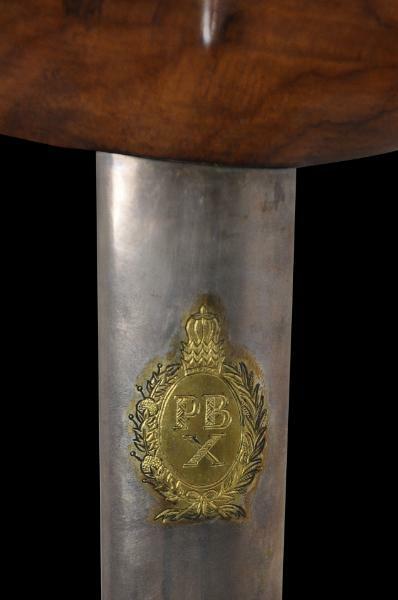 The scabbard is of wood. The back is fully encased with white sheet metal. 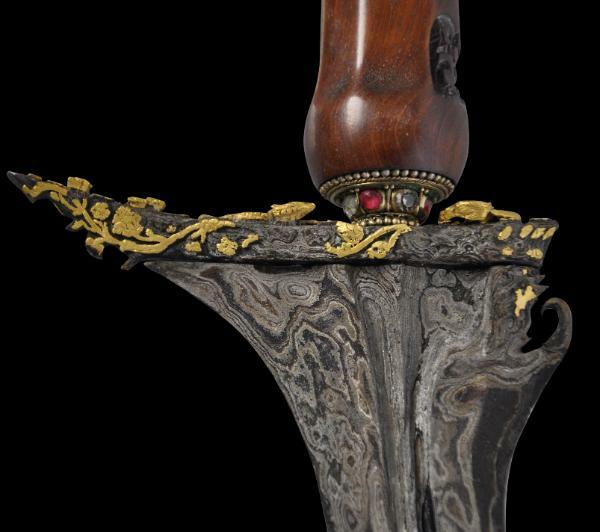 The front is partly enclosed with gilded, scrolling, pierced metal mounts that have been inset with many faceted red and clear stones. pamor iron. 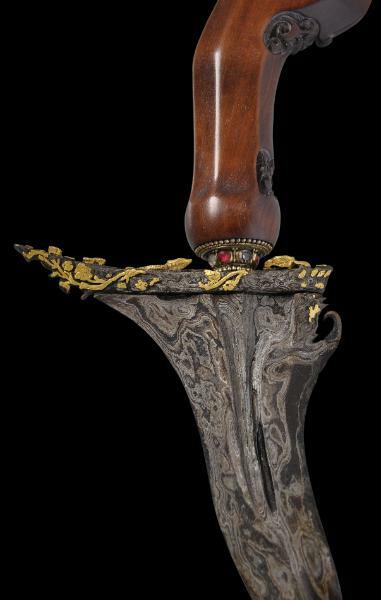 The top of the blade is chiselled with an elephant (gadjah) and a feline animal (perhaps a lion) on either side, and these have been thickly gilded (gold plated), as has an associated scrolling vine motif. wrangka) is in stylised boat (gayaman) form and of lightly grained wood. 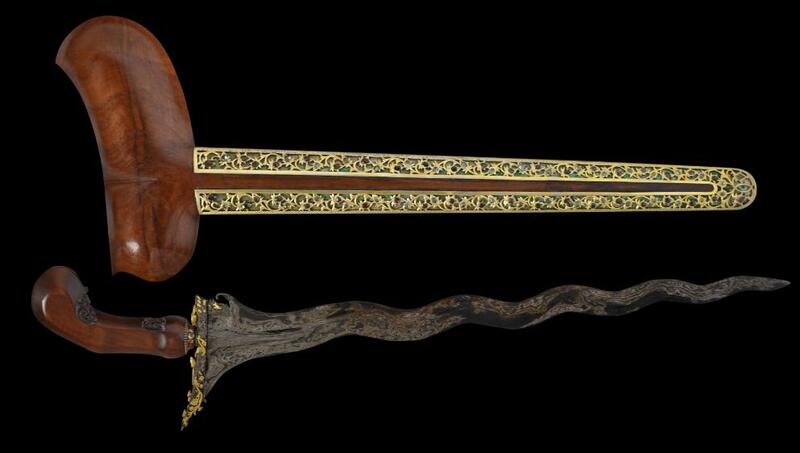 The carved hilt or hulu is also of carved wood. 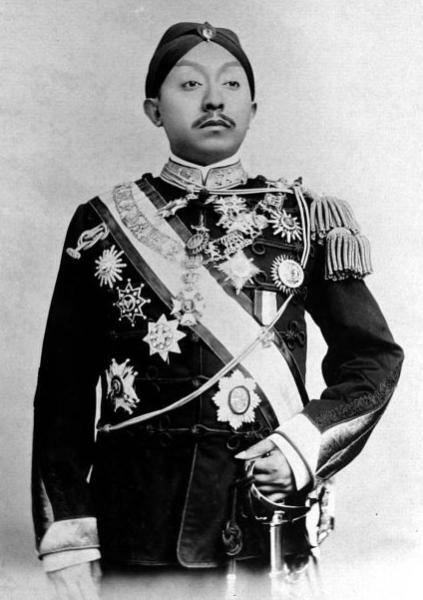 Pakubuwono X (b.1866-1939) was the tenth Susuhunan (ruler of Surakarta). He had many wives and concubines. His main consort was GKR Hemas, the daughter of Sultan Hamengkubuwono VII of Yogyakarta. He reigned from 1893 to 1939 and is the longest ruling Susuhanan of Surakarta to date. The kris is in very fine condition without any obvious losses or restoration. van Beek, A., Life in the Javanese Kraton, Oxford University Press, 1990.
et al, Rites of Power: Oriental Weapons: Collection of Jorge Caravana, Caleidoscopio, 2010.